A great middle grade mystery story puts child heroes into the position where they are the only ones who can solve the mystery. Sometimes it's because they don't trust the adults in their lives enough to involve them. Sometimes it's because adults aren't present. And sometimes it's because the adults around think the mystery is a joke. The Parker Inheritance by Varian Johnson is one of the latter kind. Candice is spending the summer in her late grandmother's house due to some complications with her separated parents and their house in Atlanta. When she meets Brandon, the boy across the street, and discovers that he loves reading almost as much as she does, she thinks she might have found a friend. And when she discovers a long-forgotten letter in her grandmother's attic, a letter that speaks of a fortune hidden in town awaiting the person who can solve the puzzle, she knows she and Brandon have to try to find it. Her grandmother tried and failed. But now Candice has another chance. Everyone thought Candice's grandmother was crazy for pursuing the Parker Inheritance, and when she didn't find it, they forced her to resign from her position as City Manager. So of course everyone thinks that the fortune is a myth. And it's going to take two kids with the power to believe and the perseverance to solve the clues to figure it out. Candice and Brandon begin to decipher the clues in the letter, a challenge that will lead them to research the town's history, racial injustice, forgotten heroes and a true love story. But can two kids do what no adults have been able to do in decades? Can they solve the mystery before time runs out and the answers fade back into the past? Kids who like puzzle mysteries and solving riddles are going to eat this up. And it's a story with meat on its bones. As Candice and Brandon are researching, they discover a lot of unsavory stuff that happened to the African Americans who started the whole thing in the 1950s. They learn a lot about their families and their town and themselves as they try to piece together where the fortune came from and where it might be hidden. The Westing Game by Ellen Raskin (Puffin, 1978). The original? fortune-hunting children's mystery story, this is still a classic beloved by many. Candice reads it in the book, a fitting homage. The Emperor's Riddle by Kat Zhang (Aladdin, 2017). Take an armchair travel trip to China as Mia tries to find her aunt and maybe a fortune beyond imagination. Under the Egg by Laura Marx Fitzgerald (Dial, 2014). This art history mystery will especially appeal to kids who like the historical and research themes in The Parker Inheritance. 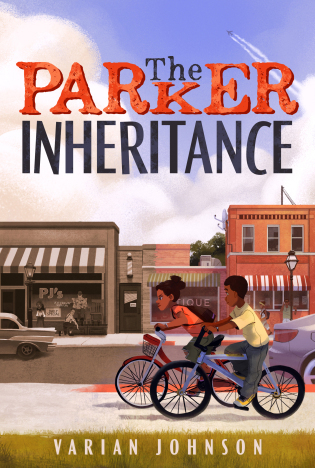 The Parker Inheritance by Varian Johnson. Grades 4-8. Scholastic, 2018. 352 pages. ARC provided by publisher.